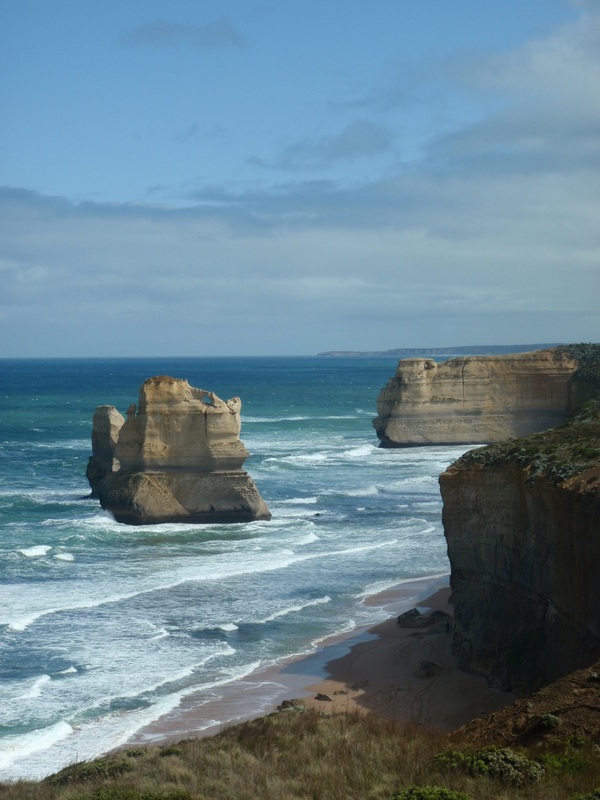 The Great Ocean Walk in Victoria runs from Apollo Bay to the 12 Apostles. It is a great track to explore for a few days. 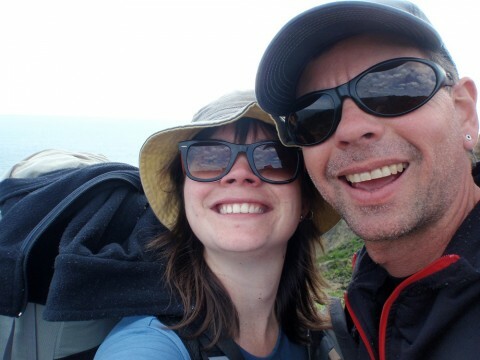 In this article, Clare Reilly (our daughter) writes about her recent trip from the Cape Otway Lighthouse to the magnificent 12 Apostles with her husband, Jay. 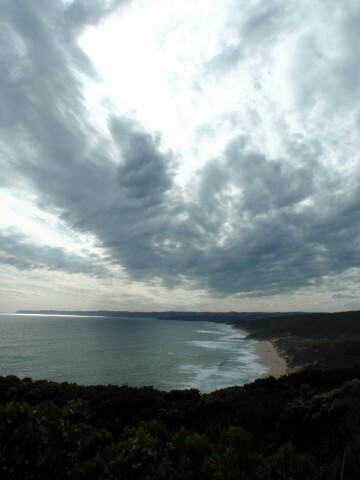 After finally getting onto our shuttle and arriving at Cape Otway at 3pm, we started our 10km walk. Walking past the Cape Otway Cemetery (a great place to stop and have a look). This day was the beginning of the spectacular views! Seeing capes in front and behind us. There’s an option for a beach walk, we decided to take the high road in this case as it was getting late and we knew there was an unavoidable beach walk on day 2. Aire River campsite was so full, particularly with the Scout Group from Melbourne, who had not only not paid their fees but they were also walking in the wrong direction along the track. 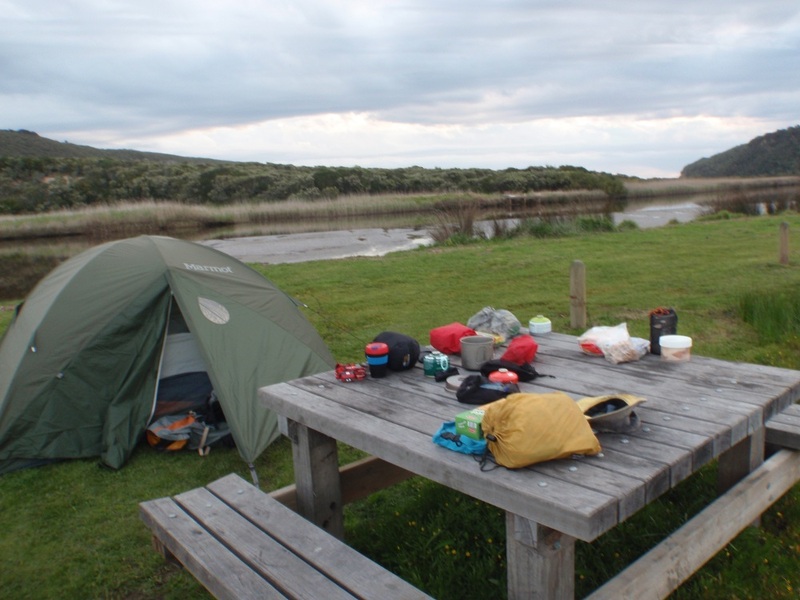 We walked the 100m back down to the drive in campsite and camped by the river. It was lovely, with only a small amount of mosquitoes and a little rain. We woke up rain squalls, thunder storms coming through and no clear skies on the horizon. After a lazy morning, we slowly packed up, avoiding the worst of the rain, and then finally left camp around 9 am. Today was a day for full wet weather gear, so we departed with our rain pants and coats on. 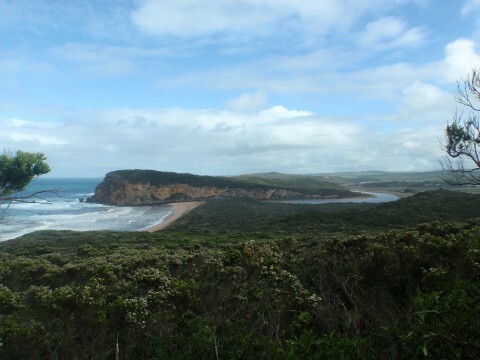 The walk starts in land and then makes it’s way towards the coast. Once you finally make it to the coast the views are breathtaking! Walking with the cliffs above you is an amazing experience! Walking along the beach is tricky! I was so excited for the sun that seemed to be shining, I took my shoes off, and skipped along the beach! Once we’d crossed Johanna River the rain started! And it was heavy and horrible, blowing sand into our faces, shoes, packs, I was trying to put my shoes on and my rain gear back on. It was just horrible. Walking up from the beach, the GOW wasn’t super well signed. We walked up the track to the car park, you can go up to the lookout if you want, and then continued up past the GOW group campsite on the right. This is where it got a little confusing, we stopped and talked for a while, it turns out that we needed to continue through a gate (or 2), along a grassy track, fairly unmaintained, this is Old Coach Road. You walk on this quite a bit over the next couple of days. You just continue a little longer up the hill and then there’s a sign confirming that you’re going the right way. This camp is magnificent! From the hut there is fantastic views, our tent had wonderful views. It was just stunning! It was this night we met 5 lovely nurses who worked in ICU in the Royal Melbourne Hospital. Who were lovely enough to run down to our tent post-thunder storm, to invite us up to the hut for tea. We joined them for dinner too. Waking to find that the weather had cleared somewhat was a lovely surprise. We walked up a spectacular valley filled with kangaroos. The morning was spent mostly on 4WD tracks. We flew along these tracks and made it to Milanesia Beach in no time at all. The tracks leading up to the beach were super slippery, we had to be really careful. The beach was good this time (I’m not a fan of sand), I didn’t have to take my shoes off and we were only on the beach for about 300m. It turns out that the far end of Milanesia Beach was washed out and wasn’t even walk able at low tide. So we took the inland route, yet again. Camp was only a few kilometers on from there, however they were STEEP! We climbed up approximately 153 steps, vertically! It was tough! Then camp felt like ages from there! We finally arrived at camp, only to be met with 6 people filling the hut. They were just about to head off, they informed us, as they had arrived at camp at 3:30am that morning, after starting that days walk at midnight the night before! They had sleeping bags attached to the outside of their packs, they were carrying their tents, and had those massive stoves that cost $20 from Kmart. It was a concern seeing them head off, seemingly so ill-equipped. They headed off and we settled into the hut nicely, reading our books, until another couple needed directions. It seems that as this walk is so accessible, that people come along unprepared, with out a map or adequate equipment. Just as this couple headed out on their way, the 5 nurses arrived in camp. It was lovely to spend the evening getting to know them a little better, hearing their stories, how they got to know each other and how they organised themselves to be on the trip. With the campsite nestled on top of a ridge, and a lookout at the end, with apparently great views. I woke this morning to a very excited husband, it was my birthday. A cup of tea was made for me, and then fried eggs with tomatoes. He had carried in fresh eggs! 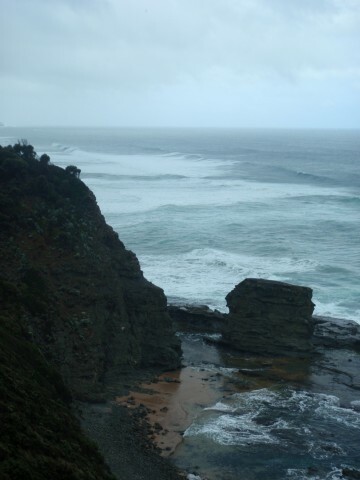 After enjoying breakfast, and packing up, we started our walk along the cliff tops. We can to a “decision point”, we could either walk along Wreck Beach or inland along Old Coach Road. Sadly the tide was high and the swell was massive so we were unable to walk along the beach. The road option, wasn’t so great! However, from Devils Kitchen we could see that a new track is being built so that you don’t have to walk along the road. We made it to camp in good time. And I was lucky enough to enjoy two macaron that Jay had carried in for my birthday! They were such a delicious surprise! We scored the campsite of all time that night, campsite 8. Our tent certainly had a view! It was amazing, we watched the sunset over the ocean. We were up and packed, ready to go by 7:30. We were both ready to get out of there and get home! The final 14.9km was fairly uninspiring, there were some great views but they were few and far between. We finally popped out and got a view of Gellibrand River, it was exciting to know that we weren’t too far off. Arriving at the Princetown Outdoor Recreation center, I was pretty bummed that we hadn’t parked our car there! From here we had 6.7km to go. That last few kilometers were long and painful! So many ups and downs, only small ones, but the new track that was put in was hard under foot, and longer than I expected. Finally when we reached our car, I did a little happy dance! I was very excited to be at the end. All in all, the track was lovely, the map not very accurate, parts fairly over grown and unmaintained, the company fantastic, and the views spectacular! Clare shares a lot of great food and lifestyle goodies over at her site, The Life of Clare. She has written an article about the food they took on this hiking trip. Well worth a look! happy birthday once again!! when my friend got up in the morning and said she could smell eggs cooking, i thought she was joking!! it was great to meet you two and hear about all your adventures. it’s nice to read about your experience of the walk. this was my second time doing this walk. i love the views, i love the mud, and the hail just added that extra touch of adventure!! i’d do it all again in a heart beat! best of luck with your next adventure!! Hey Nicola, it was lovely to meet you guys. It was a fantastic hike, and I think I’d like to do it again one day. it’s me again nicola, one of the nurses from the GOW. hope you have been on a few adventures. i just got back from hitchen brook island. great little trip, fun river crossings! i remember you guys using liquid and air tight containers to rehydrate your food during the day. i was wondering where you got them from. i’ve tried a few different brands but they are not water tight. can you give me some suggestions please? It sounds like you’ve got a great husband and I’m might impressed with the views. It’s never fun walking out at the end when you just want to be finished. I’m sorry you missed low tide along Wreck Beach. It is a great section but you certainly made the right decision not to attempt this at high tide or when the tide is coming in. New high tide route is being done at the moment. I spoke to Parks Victoria about it this week. I recommend though always trying to plan walking this section at low tide. Sounds like you had a great birthday. Happy Birthday. Vanisha (from http://vanishaslife.blogspot.com/) sent me here because she knows I have a love of hiking! And I’m so very glad she did – your posts are beautiful and I am envious of your hikes! Thanks Patty, I’m glad you liked it! It was a lot of fun. That was a great post – I’ve always wanted to do the walk and you made it sound terrific. I was wondering if you could post a list of everything that you took on the walk. A chronic over-packer I would love someone who has done the walk advise me on what to take. Thanks again and it sounded like a lovely birthday! 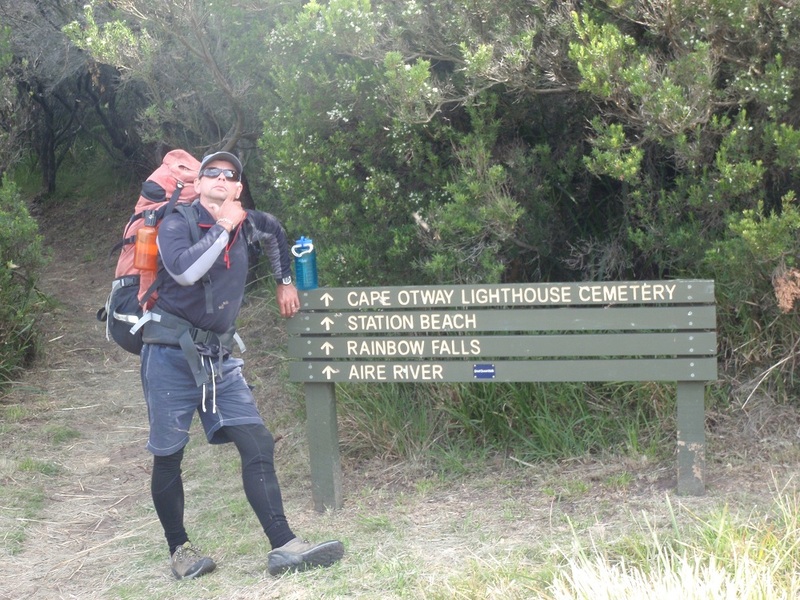 PS – have you done the Wilson’s Prom to lighthouse walk … another walk on my list! 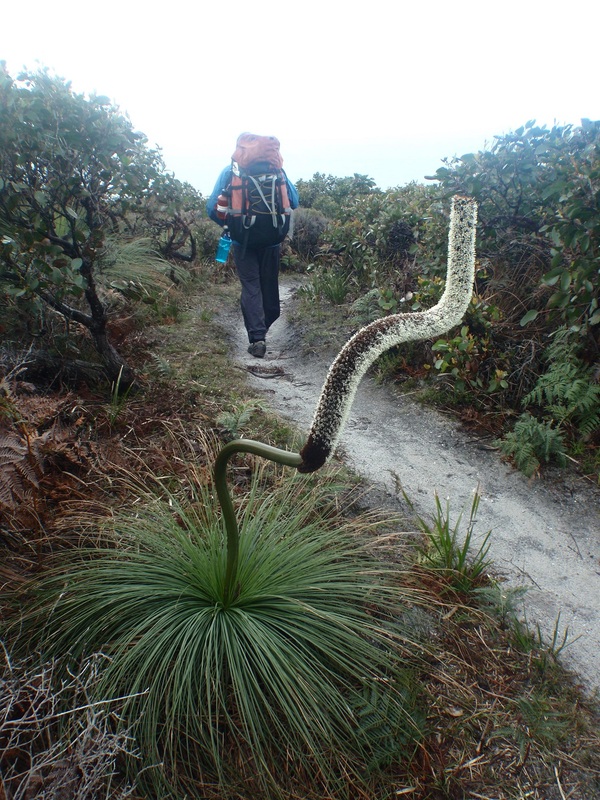 I haven’t done the Wilson’s Prom hike, I would also love to give this one a go! Becca, there’s heaps on this blog about what to pack but if you wanted to get in contact, head over to my blog and I’d be happy to send you an email. Beautiful, beautiful scenery! So different from my hiking environment, in the heart of the Alps! Hi i’m planning to hike 4 days of the great ocean road with 4 friends. we are all 15 with minimal hiking experience. Im concerned that it will be too much of a challenge. We are going to have the correct gear (packs, boots, cooking utensils etc), but will be going in the heart of winter. What is your opinion? do you think we will be able to complete the walk safely? 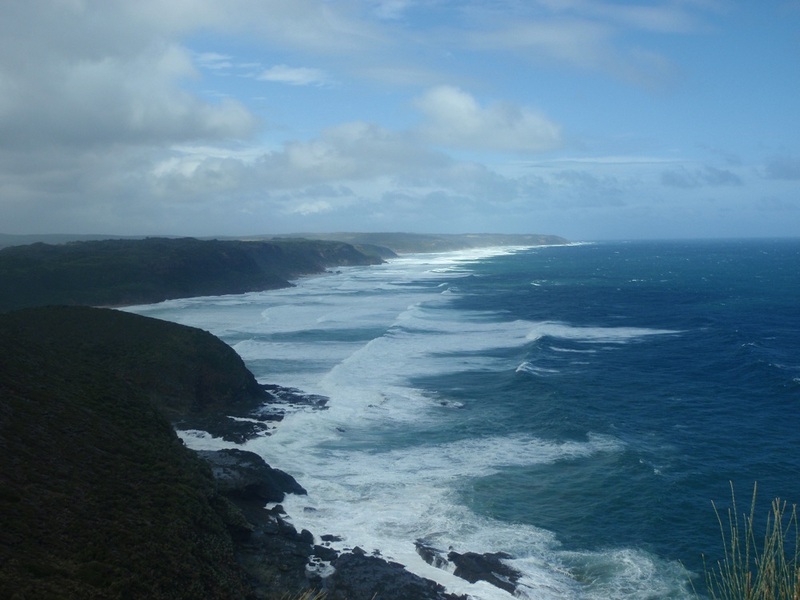 The Great Ocean walk is awesome! If you can walk for 3-4 hours in a day you will be fine! The weather gets a bit dodgy down there in winter but at least it does not snow! If you have good raincoats and clothes that dry quickly (no cotton or denim) you should be fine. Also, really try and keep your pack weight down as low as you can get it. If you spend a bit of time looking around our site you should find a lot about gear and clothes that will work for you.